Karen Kitchel’s landscapes are definitely not traditional. Of her work Karen states: I paint them with the traditional craftsmanship of the genre’s past, and a critical eye on the geography of the present. 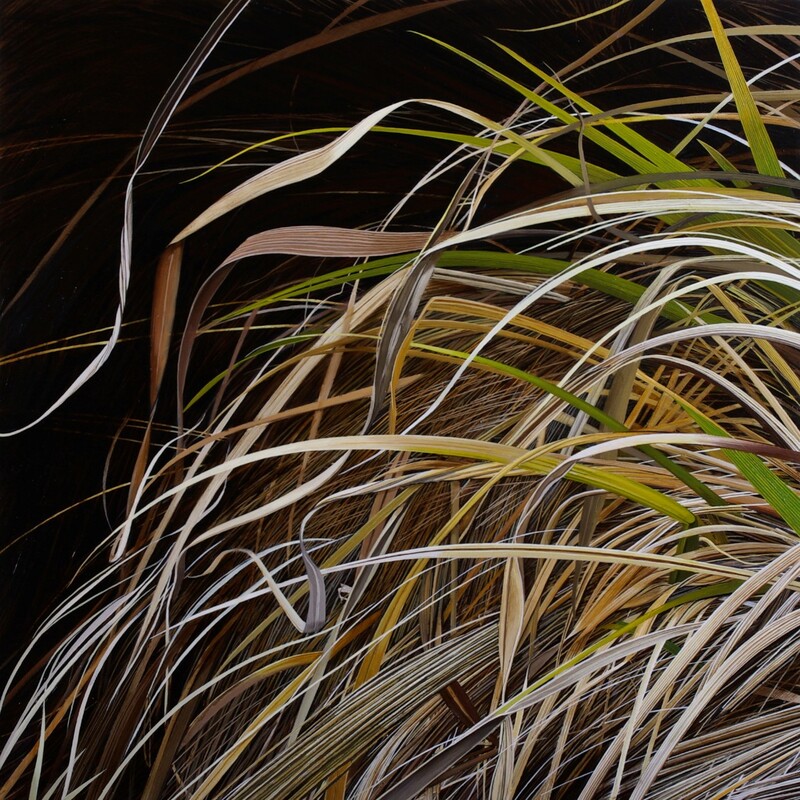 She narrows her focus to a small patch of dried grasses or what you may always have considered just plain weeds. In isolation we see their architecture, we sense the brittleness of leaves, the wonderfully chaotic arrangement of stems and leaves. These generally small wood panels, square or rectangular, allow us to see familiar details or fragments that are often un-seen — weeds our pants legs brush by or that are trampled underfoot. Seen in groups, these paintings create a sense of time elapsed, of seasons passing, and create a subtle awareness of how the land has been sectioned off, divided. Another series, Home on the Range, overlays images of industrial intrusion into the western landscape on what might be picture postcards of an another era. Karen earned her BA in Art at Kalamazoo College and MFA in painting at Claremont Graduate School. She exhibits throughout the country and is widely collected. Karen’s documentation was sponsored by David and Patricia Herman. The AfterGlow was hosted by Kevin and Christine Beirne.